Tampa is a city of immigrants – travel the byways of Temple Terrace or Clearwater and you can find almost any variety of ethnic grocery store, and South Tampa gets to taste the benefits in the form of an array of fantastic global restaurants. But one of the most public, friendly, and authentic ways to get a glimpse of Tampa’s immigrant life has to be a Sunday-morning visit to Wat Mongkolratanaram. Wat Mongkolratanaram (http://wattampainenglish.com/) (mercifully a.k.a. 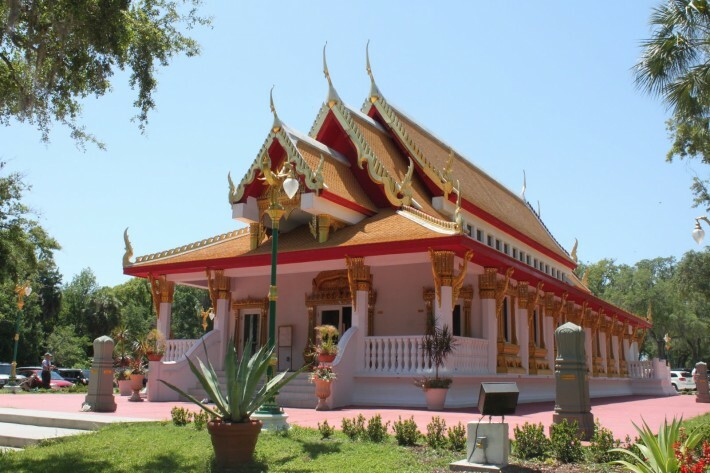 Wat Tampa) is a Thai Buddhist Temple serving Tampa’s Thai community. It sits on the banks of the Hillsborough River just east of South Tampa, and every Sunday its parishioners hold an open Sunday Market, where they cook and sell a variety of authentic Thai home cooking. The temple’s story (http://wattampainenglish.com/temple-history.html) is pretty amazing – it was founded in 1981, and its members have spent three decades expanding it to what you see today – including a glittering artwork of a central temple, where on Sundays you can catch both Buddhist services and a friendly cultural introduction for outsiders. The temple has expanded in large part with proceeds from the Sunday Market, which began with two tables in 1993. Now, it sprawls across the length and breadth of the place, including not just dozens of kinds of food, but fresh herbs and a variety of potted plants, as well. Not surprisingly, you can get a really good deal here on herbs that are important to Thai cooking, like lemongrass and galang. The experience of visiting this cultural landmark during the Sunday morning market is one of Tampa’s truly unique pleasures. Look around and you’ll see all types of people coming together in a friendly, peaceful environment, spreading out on the dozens of red picnic tables, and strolling a few short paths – but most of all, enjoying rich Thai food cooked by the Temple’s members. To get to Wat Tampa, take I-4 east from downtown, take the North 50th street exit heading south, then head east on Palm River Road until you hit the slow-moving column of cars waiting for a spot in the Temple’s crowded parking lot. Don’t’ worry, though – the small army of parking attendants find a way to squeeze everyone in, and after that, the bustle is part of the charm.